We want to make a game, so we will need a way to draw 2D and 3D objects on the screen. We will do this by using the amazing Open Graphics Library (OpenGL). In this tutorial we will learn how to use OpenGL in Java create a Renderer class that can be used in our games. The interested reader can find in-depth knowledge about OpenGL in the Wikipedia OpenGL article. We will have to create a Window, tell OpenGL to use it, draw on it, clear it and then draw on it again (and so on). At some point we will also have to initialize a few resources like textures and to keep our system clear, we need to free them at some point as well. To test everything, we also want to implement a function that draws a simple quad on the screen. All those things are not completely easy to do. We want to make several games in the future, and we certainly don't want to worry about those problems every single time when we start a new game project. To solve this problem, we will create a Renderer. Our Renderer will take care of everything and it has to be re-usable over and over again in different games. The implementation presented here is simplified as far as possible. When making more complex games, the Render code will get bigger and bigger. A few things can seem very complicated at first, but we implemented it that way to make it as easy to use as possible. Ever heard of glOrtho and glViewport? Do you know how to switch from 3D to 2D rendering? Those things can be complicated. The good news: the Renderer will take care of all of this. We implement it once and then never worry about it again. Note: we are using the Eclipse IDE for Java Developers in this tutorial. // our OpenGL initializations in here. // that 3D has to be drawn will be drawn here. // that 2D has to be drawn will be drawn here. // everything that has been initialized here. Note how the Game class extends the Renderer class. The result is that all the rendering logic happens in the Renderer class (that we are going to create), and all we have to do to make our game is fill out onStart, onDraw2D, onDraw3D and onEnd. It's very simple, we don't have to worry about anything at all. Note: what happens behind the scenes can seem rather complicated to beginners, that's why we want to do it only one time, put it all into our Renderer and then never think about it again. A few things in this tutorial, like abstract methods or setting up OpenGL can be a bit tricky, just read over it a few times and play around with the code to understand it completely. Don't get scared! The following steps might seem a bit unusual at first, but it's actually really simple in compare to programming languages like C++. When doing those steps the second time, it won't even take you longer than 10 seconds. Download the latest LWJGL version here: LWJGL Download. Extract the downloaded file with the zip unpacker of choice (for example 7-zip). Move the LWJGL folder to our project. To keep things clean, we create a new folder called "libs" in our project and then move LWJGL in there like in the picture. If eclipse doesn't see the libs folder after it was created, simply select the project and press F5 to refresh everything. Include LWJGL in our project. 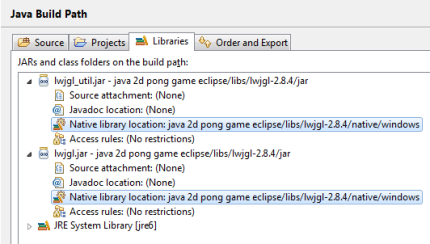 Simply right-click the game project in Eclipse, go to Properties, Java Build Path and select the Libraries tab. Click Add JARs..., navigate to project/libslwjgl-version/jar/ and select lwjgl.jar. Repeat the process for lwjgl-util.jar. Native Libraries: the last thing to do is to set the Native Library path for the lwjgl.jar and lwjgl-utils.jar files that we just included. 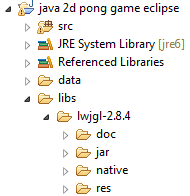 Go to the Libraries tab again, click the small arrow left of lwjgl.jar to expand the menu. You will see Native Library Location: (None) there. Simply double click it, click on Workspace and then navigate to libs/lwgj-version/native/ and then select the folder depending on your operating system. Repeat the same for lwjgl-util.jar. Our Renderer will need a few member variables. We have to store the width and height of the window (in case they are needed somewhere), and we need a small helper class called Interval to measure the elapsed time between frames. This is very important for framerate independent games. For example, a car in a game should always drive with the same speed, independent of how fast our computer is and how many FPS we get. Our in-depth tutorial about Interval can be found here: Java Interval. That's as easy as it gets. All we have to do is pass the width and height of the window, as well as the title and LWJGL will do the rest for us. While every single setting has a good reason behind it, it would blast the dimensions of this tutorial if we would go into detail about each one. For now we will stick with those settings and not worry about them at all. It will be implemented in the Renderer. In the Start function we will be able to initialize things like Textures, the Update function could calculate their positions, the Draw function puts them on the screen and the End function frees them again. That's it, or almost it. We can see a few functions that simply have to be there and have to happen in order to do things right. Let's focus on the important parts: onStart(), onUpdate(), onDraw3D(), onDraw2D(), onEnd(). They do nothing, exactly. Keep reading to figure out why. Note: the dT parameter stands for delta time, which means how much time has elapsed (in milliseconds) since the last time the function was called (since the last frame). Previously we set up our Main Game Loop, but we just learned that onStart(), onUpdate(), onDraw3D(), onDraw2D() and onEnd() don't seem to do much at all, why is that? The reason is simple: those are the functions that we will fill out in every single game. In the Renderer class they are abstract, which means that they are placeholders. Now if we create a new game, all we have to do is fill them out, that's basically it, that's how we make a game! To make things more clear: this is what we wanted to do in the beginning, we wanted to move all the complicated OpenGL stuff into our Renderer class and then only fill out those abstract functions in every game. Scroll to the top to see it again. Again we can see a lot of confusing OpenGL calls. Basically all we do is adjust the viewport size and then switch to 2D mode (glOrtho) or 3D mode (gluPerspective). That's all we need to know, the details about why this works belong into an in-depth tutorial. Good news: the complicated part is done. Now we have our Renderer, we have a basic idea of what it's doing and now it's time to use it. But wait, one more thing. We will need to draw quads all the time, so why not already create a function for this and put it into our Renderer as well. It will save us a lot of work later on. This function draws a quad in the 2D dimension, so we can use it for HUDs (and more). The glVertex2f function sets the points of the quad. The glTexCoord2f function is there in case we want to put a texture on the quad, but we don't have to worry about it now. Please make sure to move the drawQuad function into the Renderer. It's so ridiculously simple now that we have the Renderer class, I am sure your 5 year old sister could do it. Note: @Override is not part of the code, it's just an annotation. Let's take a look at the cube (3D) example. Since we didn't create a drawCube function in our Renderer yet, we will have to do this manually (that's why it looks so long). We just created one of the most complicated parts of every game: the Renderer. Even though it was fairly complicated, it's very simple to use now, so it was worth the effort. From now on, every time we create a new game we don't have to worry about anything at all. We just create the project, add our Renderer and life is good.